I spent 30 years of my life working full-time in education, teaching a wide range of subjects including science, chemistry, IT, computer networking and, of course, photography. It was hard work during term-time, particularly in the early years when I was a teacher and then a head of department in a very large secondary comprehensive, when 60+ hour weeks were normal for me during term times, with lesson preparation, planning, marking and administration taking up perhaps one and a half times as much time as the actual class contact – then around 24 hours a week. Anyone who thinks teachers have it easy – and who looks on it as a 9 to 4 job has never tried it, or not at this level. Then – in the 1970s – the workload we had was at the high end for the profession, and others working in primary schools or grammar schools or even some smaller comprehensives did have an easier time, but those days are now long gone, with the National Curriculum and Ofsted making the kind of hours those of us at the sharper end had to put in back then universal. Like many teachers, I went into the profession for idealistic reasons, though many of these were frustrated by the problems and pressures I met. Now the pressures are much greater, and driven by government interference and a spectacularly vindictive and doctrinaire inspection system that rewards blind compliance and attempts to stamp out initiative and individuality. Things started to get really bad in the 1990s, and I was glad to be able to resign at the end of that decade and take up photography and writing about photography. Now things are even worse, with an education minister driven by hare-brained ideas from failing systems abroad and deaf to the advice of many educationalists in the UK. 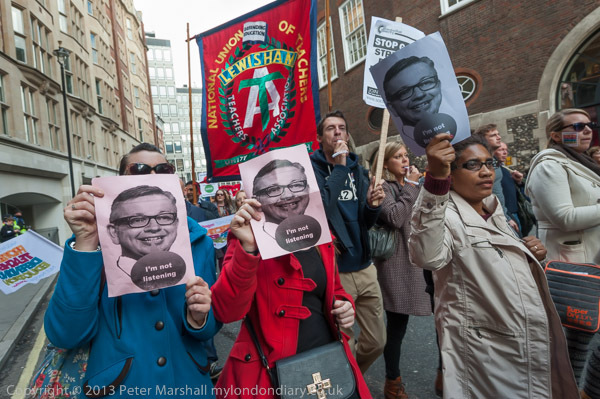 Education Minister Michael Gove seems to hate and mistrust teachers, and is setting out to increase workloads and destroy the collective agreements that have governed teachers’ pay and conditions. Add to that the raising of the pension age, with teachers in the future being expected to work until they are 68 and it is hardly surprising that teachers are very angry, both for themselves and over the future of state education. 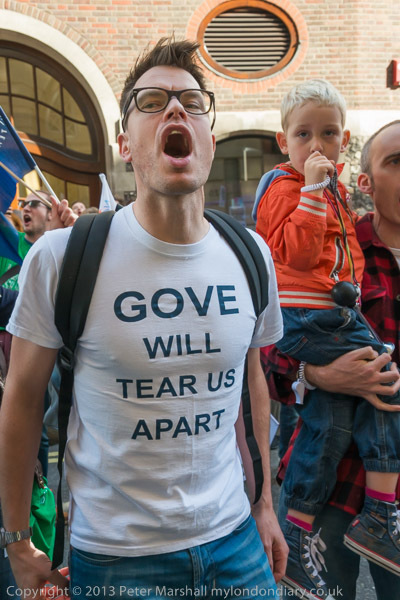 Much of that anger is against Gove, universally loathed across the profession. 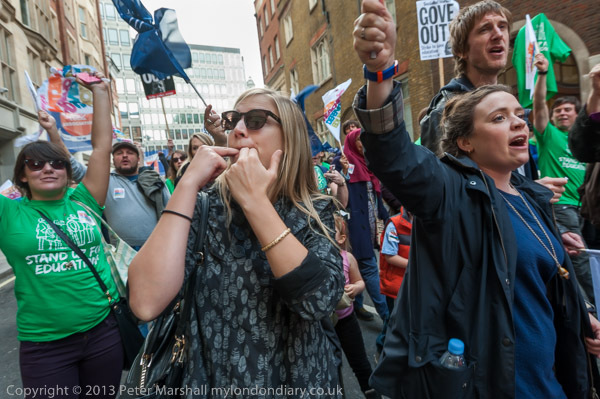 I’d put the march through London from Malet St to Westminster into my diary a month or so earlier, and only checked on it again on the morning it was taking place. When I did so I found that the time I’d been given had changed, and that I had no chance of covering the start. I decided that if I caught the next train I could probably meet them in Whitehall, and that proved to be the case, though I had to run a couple of hundred yards to be opposite Downing St as the head of the march reached there. As expected, some teachers reacted strongly as they passed the gates to the street, shouting towards the Prime Minister’s residence hidden away behind the gates guarded by armed police, and I took a few pictures, before hurrying along to the head of the march to photograph it going past the Houses of Parliament. It’s always good to get a few images with Big Ben in the background. It’s tricky to get good images unless marchers stop and pose, as you have to work from a fairly oblique angle to include the protesters and parliament. Often the best opportunity is when marchers are some way along the front of the square, but marches like this that turn up away from parliament give a better opportunity on or just past that corner – as in the image above. 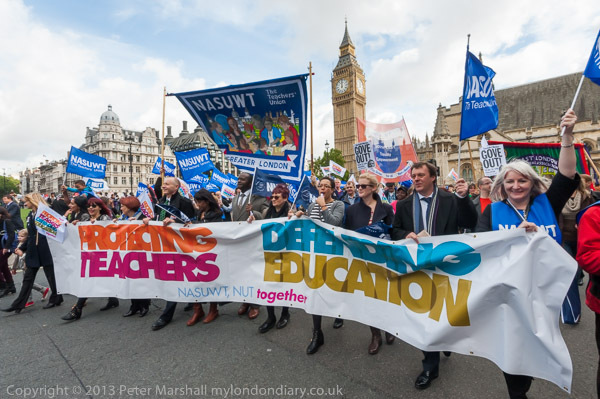 I kept with the head of the march as it came up to the Dept for Education a quarter mile or so further on. It doesn’t really stand out in pictures – and when people are just marching past it’s seldom possible to include it sensibly. But I knew that here was another location where the anger would emerge visibly. I’ve seen a few pictures from the rally published in newspapers and magazines, and I think mine show that anger more clearly. There were far more on the march than the hall a couple of hundred yards further on would accommodate, and as it filled up, the march came to a halt, still stretching back a fairly tightly packed third of a mile by the time I left half an hour later. Estimates put the numbers in London at 15,000 and there were other marches and rallies across the country. I made the mistake of trying to get to my next appointment by bus, but the teachers’ protest had completely disrupted the bus services and brought traffic in London to a complete standstill. When I finally found a bus that was running, it went a couple of stops before coming to a halt, with the driver advising us that if we could walk it would be faster. And it was, but not fast enough, as by the time I arrived the protest had finished and dispersed. 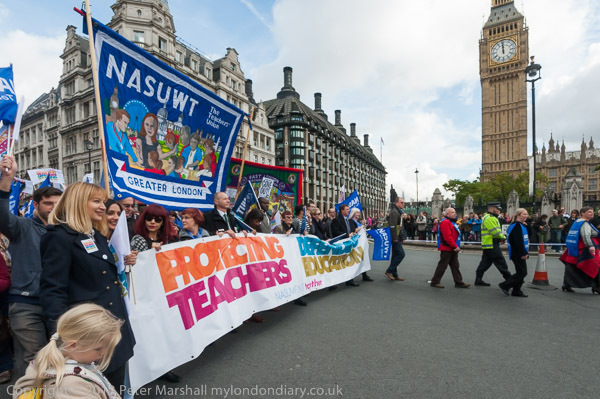 More pictures of the march and angry teachers in Teachers March against Government Plans. More About My Teaching Career – and how I managed to be a photographer too. I began my second teaching post (the first had been a couple of terms filling in time before getting my teaching qualification) as a science teacher at one of the country’s largest comprehensives, and stuck it out for almost ten years, considerably longer than average for the school, getting promoted three times over the years. Most weekdays I’d get up at 7am to get to work for 8.45am, teach until 4pm, with ten minutes for a cup of tea in the morning. If I was on lunch duty I’d eat a free school lunch as a part of the lunch break, otherwise I’d bring sandwiches so I could get on with marking and other jobs. When the ‘students’ left, I’d be clearing up and tidying and perhaps some more marking before leaving for home and dinner. This was the only relaxation during most days, and I’d often manage to listen a little to the radio while eating or washing up after the meal, but then it was time to get back to work again, usually until around midnight. It was a tiring schedule, but it did make it possible for me to take the occasional day off at the weekend for photography – and of course there were the holidays – but after 10 years it had worn me down, and I took a drop in pay to move to a less demanding teaching post in further education. There with a similar amount of ‘contact hours’ I could put in a 40 hour week and get the job done. And by taking on some evening classes, I managed to arrange myself one or two free afternoons which I could devote to my personal photography through the year as well as during vacations. Teachers in the UK I think have to be at school on 195 days a year. With 52 weeks of 5 days the full working year is 260 days, so there are 65 days free – but probably I spent around another 10 on school work, writing new courses, leaving me with around 55. In industry in the UK my friends were getting 30-40 days leave per year (including Bank Holidays) so this was a significant advantage in pursuing my photography – making projects like that I took in Hull over several years possible. Moving to FE freed me up for a half day of work during the week and made a number of major projects in London possible. In the late 70s and early 80s I did consider leaving teaching and going full-time in photography. But I had a family and needed a regular income to support them. Teaching was a way to do that and to continue with some photography. This was a relaxation from the teaching, and helped me keep at that. I wonder if I had been working all day as a photographer I would have wanted to do the same amount of personal photography as well. Many over the years have asked me how I could do both, and it was simple to answer – I just asked them how many hours they spent watching TV. I last lived in a place with a set in 1968. This entry was posted on Friday, November 22nd, 2013 at 08:57 am and is filed under My Own Work, Photo Issues, Photographers, Political Issues. You can follow any responses to this entry through the RSS 2.0 feed. You can leave a response, or trackback from your own site.